Sarah Nader- snader@shawmedia.com Prairie Ridge's Nick Fetzner is taken down by Marian Central's Thomas Welch while wrestling at 170 during Wednesday's meet at Marian Central High School Wednesday, January 6, 2016. 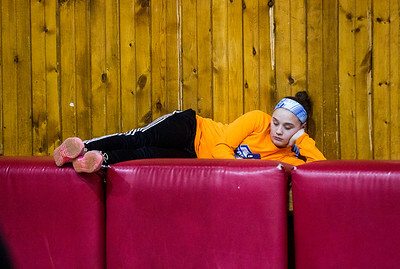 Sarah Nader- snader@shawmedia.com Zoe Villont, 13, of Woodstock relaxes while watching a wrestling meet against Prairie Ridge at Marian Central High School Wednesday, January 6, 2016. Sarah Nader- snader@shawmedia.com Marian Central's Joey Fitzgerald (top) and Prairie Ridge's Travis Piotrowski wrestle at 126 during Wednesday's meet at Marian Central High School Wednesday, January 6, 2016. Sarah Nader- snader@shawmedia.com Prairie Ridge's Brendon Ewing and Marian Central's Ethan Edmondson wrestle at 160 during Wednesday's meet at Marian Central High School Wednesday, January 6, 2016. Sarah Nader- snader@shawmedia.com Prairie Ridge's Drake Regenhardt (left) and Marian Central's Joe Herff wrestle at 152 during Wednesday's meet at Marian Central High School Wednesday, January 6, 2016. Sarah Nader- snader@shawmedia.com Prairie Ridge's Eric Comstock (top) and Prairie Ridge's Elias Edmondson wrestle at 138 during Wednesday's meet at Marian Central High School Wednesday, January 6, 2016. Sarah Nader- snader@shawmedia.com Prairie Ridge's Luke Silva (top) and Marian Central's Anthony Randazzo wrestle at 132 during Wednesday's meet at Marian Central High School Wednesday, January 6, 2016. Sarah Nader- snader@shawmedia.com Prairie Ridge's Luke Silva (left) and Marian Central's Anthony Randazzo wrestle at 132 during Wednesday's meet at Marian Central High School Wednesday, January 6, 2016. 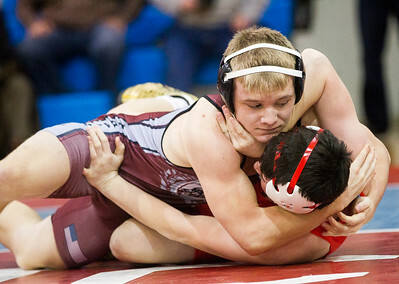 Prairie Ridge's Luke Silva (top) and Marian Central's Anthony Randazzo wrestle at 132 during Wednesday's meet at Marian Central High School Wednesday, January 6, 2016.